What Does Tarot Mean to a Blind Person? Tarot, at least for me, has really helped me in my studies. I’ve been using the tarot cards to give insight and guidance to those who need it most. There are those who think I’ve been working with the tarot for many years, however, I’ve been working with the tarot for only two. Because I cannot see physically, I’ve learned to use my intuition to seek guidance not only for my friends around me, but for myself as well. When I read with the tarot, I don’t filter anything that my intuition tells me. For me, the tarot is like a mirror, a place to look and see what’s going on in a person’s life. I’m now certified as a tarot reader with the Universal Ministries, and I’m working on getting the second level of certification with the American Tarot Association (also known as the ATA) who I’m currently certified with as an Apprentice Tarot Reader. The first level of certification is called CATR, which stands for Certified Apprentice Tarot Reader. There are five levels of certification, but I’m only going to go up to the level CPTR, which stands for Certified Professional Tarot Reader. I am also in the process of creating a web site for friends and family. I update it as I go along with my tarot studies. There are 78 cards in the tarot. There’s no more, and no less in a standard tarot deck. Each card is a key. It opens a door in your life for growth. If I know a person’s birth date, then I’m able to tune into the energy of the birth date. To me, the birth date is like the beginning. It tells what you were like when you were born, and I take it from there. I tune into the vibrations of the first name, birth date, and the vibrations in the person’s voice. If the person is referring to another person, for example, in a relationship reading, I would ask them for the other person’s first name. Also, for the other person’s birth date, if they know it. If they don’t know the person’s birth date, then I just pick up on the vibrations of the person’s first name. Then, I compare the two people, and see if they’re compatible or not. The tarot is like looking through a window. It’s like my eyes to tell me what’s going on around the person and the energy surrounding the person who I’m reading for. I recently bought the Crowley Thoth Deck, which before was too hard for me, but I’ve read accurately, and I’ve done my best readings with it. It has a lot to do with the Quabalistic and Astrological symbolism and was created by Aleister Crowley. I love the Thoth deck a lot. It’s a beautiful deck that I’ve used to help people on the right path. After my grandmother passed away, tarot played a huge role in my life. It never fails to give the correct insights and accurate results to the person I am reading for. This, at least for me, is like learning another language. 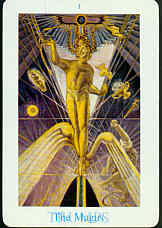 The Tarot is a symbolic language, and the Crowley Thoth deck really does speak to me! Each card in the deck of 80 picture cards gives inspiration and hope to a part of my life, and for those around me whom I read for. There are two cards that are called the Magus. These are believed as the Chiron, and Fusion. Chiron is a star, and it’s an Egyptian symbol. It has been said, that Chiron and Fusion would be cards 23 and 24 of the Major Arcana. The tricky part of reading tarot is the interpretations. You have to find the correct interpretation for each card and there are about twenty of them. The tarot empowers me to receive the guidance I need to make the right decisions. I feel that the tarot deck I currently use has really struck some cords, not only in myself but in others, too. If I feel that a person I am reading for shouldn’t have their reading, I say, “No, I don’t feel the time is right, maybe later, or another day.” I also dislike it when others touch my cards without my consent. Clients usually don’t come in contact with them when I’m doing an in person reading. If I feel comfortable enough to let them handle my cards, I usually have to cleanse my tarot deck by shuffling. My cards, at least for me, are a sacred tool of inspiration and spirituality. These cards are very personal to me, and I’ve developed a great, strong, and effective, relationship with my tarot deck. All of my readings are completely confidential and anyone interested should schedule an appointment to have their reading with me. A reading consists of describing the past and picking up on current situations in a person’s life. Also it gives the proper guidance and insight into a situation, or problem. Everyone’s outcome varies and is unique to their situation. As you already know, the future isn’t written in stone. We all have will power and are able to change it. I don’t consider the tarot a form of fortune-telling, as others might think, but a guiding tool, either for spiritual readings or just to gain insight into a particular situation. I adhere to a code of ethics that I developed according to the voice, or style of readings I’m able to offer, and conduct. It’s very surprising what cards come up when I ask them a question. I can completely relate to the cards that I draw. I often wondered, at least for me, if the tarot cards could hear me. It isn’t true and here’s why. When I ask a question and draw a series of cards, I’m tapping into the subconscious universal energy, or field that surrounds me. It’s the subconscious universe that I’m currently tapping into when doing personal readings. My intuition also helps me in a person’s reading and I always try to listen to my inner voice. Sometimes, it can be very difficult, and a bit of a challenge, but I can do it. The tarot cards are my guide — they’re like my best friend. I look at a tarot reading as a form of counseling or going to see a psychologist. A tarot reading helps me learn about a person from the inside out. It’s a tool of personal, spiritual, and psychological growth; of psychological meaning: the study of the mind. If you use your intuition, it will help guide you, and also help others in need. For me, tarot is like a map; a map to help guide you to the most positive outlook of your life. It helps your life become the best that it could be. The tarot helps heal people; healing meaning, healing as a whole. The tarot helps the person who I’m reading for gain the knowledge and the will to help with important decisions, and gain insight into a positive outcome or outlook on spirituality, wisdom, growth, and life. The symbolism of the tarot cards sound very interesting to me. Even though I cannot see the pictures on the tarot cards, there is a person who can describe them to me. Then, I can write down what the descriptions of the images are and that usually helps me in my tarot readings. The pictures help with the interpretations of the cards. I can do four types of tarot readings: 1. Spiritual reading, only using the Major Arcana.2. Open reading, again only using the Major Arcana.3. Relationship Compatibility reading, using Major Arcana, plus the other cards.4. Regular reading, covering up to six or more questions regarding any aspect of a person’s life. The word Arcana is the Latin word for secret. Usually I do three card readings if I only have ten minutes. If I have more than ten minutes, or if I were at a psychic fair, or party, then I’d do either a five, seven, or ten card layout. When the time that I spend with a person is 15 minutes, then I’d do a decision spread, if the person really needs to know which way to go. I have my own voice, my own style that I’ve developed as a tarot reader. I also can draw a card for the person I’m reading to tell me what their state of mind is. Their state of mind is the key card: the card I always have out in my readings. It reflects the present moment; where the person is at this time in their life. I’m usually about 90 to about 95% accurate. I feel that the tarot gives me an opportunity to grow and develop my intuition and hone my skills as a tarotist. When I’m holding a deck of tarot cards, I’m holding the whole universe. Sometimes, people don’t understand what I’m saying, so whenever I begin a tarot reading I always let the person know, that if they don’t understand something, I can try and explain. The other option I can do is draw one or two clarification cards. It helps to give more information about the situation or question that the person is asking. I also use my intuition to tell me when to stop shuffling the deck.I also can draw a card for a friend every day, and send them by E-mail. I really know how to read a person in relationship to the question, or situation. When I conduct a reading, I first look at the cards individually, then look at combinations, and then put it all together as a sentence for the person to see how everything fits together. Overall, tarot is one of the things I really love, and hope to work part time later on in my life! Anyone can do it; they just have to have the time, energy, and the most import thing: a desire to learn.So in conclusion, I am mostly a tarot reader that uses clairvoyance, clairaudience (if it comes in), and clairsentience (the sense of feeling, or knowing, also known as intuitions). I do my readings by phone and E-mail and I can do my best to record it on tape. I’ll carry out the reading ASAP. Note: I can also pick up on people’s pets so I’m also a pet psychic as well. Veronica Harrison was born prematurely. Due to complications, she became permanently blind. Veronica has developed musical talent allowing her to learn to play a great variety of instruments ranging from piano to Celtic harp. She has also experienced a wide variation of psychic abilities including communication with her deceased grandmother. She applies all these abilities to her tarot readings using the Crowley Thoth deck. Veronica brailles the cards, allowing her to read them on her own.